At The Smile Spot in Southbury, CT, we provide compassionate, quality pediatric dental care and orthodontics to children of all ages. We are dedicated to being a dental office where kids can have fun, enjoy stress-free visits, and leave with a smile. Visit our Southbury dental office to experience The Smile Spot difference! All of our treatment areas feature flatscreen TVs, so your child can enjoy his or her favorite movie or TV show while we work. We offer a Cavity-Free Club for all of our young patients, with a monthly drawing of winners! 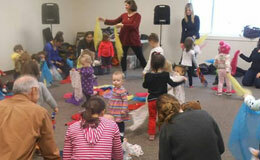 Children get their very own “kid zone,” complete with video games, toys and books. 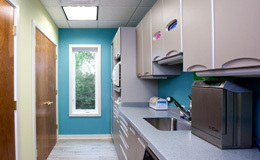 Our office is specially designed for our young patients, with smaller sinks and even a little entrance door to walk through! At The Smile Spot, we act in accordance with American Dental Association (ADA) guidelines for cleanliness and safety. We also make every effort to reduce patient exposure to radiation by using digital x-rays, which use up to 90% less radiation than traditional x-rays. Digital x-rays are a valuable aid in oral healthcare for patients. At The Smile Spot, digital x-rays are only recommended for your child when deemed necessary for diagnosis and treatment. We empower you to make wise, well-informed decisions for your child’s oral health through individual consultation and education. We also make sure to stay up-to-date on your child’s medical history, current medications and any other factors that might affect their dental health and treatment. We’re trying on fun costumes at the Smile Spot! The Smile Spot puts on fun events throughout the year for our patients and their families. From our movie days to patient appreciation parties, we’d love to have you join us. We love to show our appreciation for referrals. Referring your friends and family to our office is the greatest compliment you can give us. 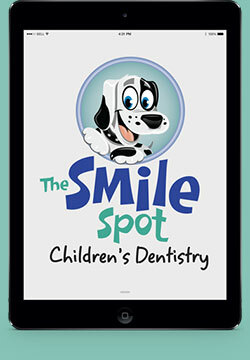 Ask one of our team members at The Smile Spot about our fun frequent referral program.